Monitor on Massacre Marketing: Abdelhamid al-Yousef: A Speedy Recovery? A Faker Caught in the Act? In this SMART News video, at about 1:20 is the following sequence: a man on his side, initially motionless with his head resting on another man's leg. Then he's hit with a spray of the fire hose. He rolls over a bit, as if to complain, and get a spray right in the face. He reacts swiftly, his hand spreading out defensively, but then the White Helmets guy sprays him in the face again, almost as if to say "roll back over and play dead, dummy." The man rolls back into his prior position, perhaps just to protect his face, maybe to resume his performance. The same man is seen in two SMART News photos found by Qoppa999 (here and here). It seems to be just moments later from context. The man is feeling better, but possibly weak (or acting that way). His pants are still on, and he's rising. A worker lifts his arm as if to help him stand, while he grabs the worker's leg for support. So if he was acting unconscious, as I first thought and still wonder, he didn't maintain the charade for very long. Consider the man whose legs he's laying on. He apparently bent his body at the waist when he noticed a wounded boy's blood pouring on his left arm (as explored here), but then remains still after this, acting like he can't move when he apparently can. Perhaps this other guy was doing the same until he realized he blew the act, and wasn't enjoying it either, and may as well act like he's getting better now. All around, we see people in varied states, some seeming genuinely distressed, dying, or dead. Some are apparently faking. People lay still, foam at the mouth, gasp and gulp for air, sit up, convulse or wiggle, depending - one state each. He does a strange mix: lays still, then jolts awake in a strangely annoyed manner, then recovers. That proves he's conscious and alert, with quick responses. He's not paralyzed or unconscious. But he might have been acting that way at first. As the MD put it on Twitter "from passed out to pissed off in a heartbeat - "Hey! I'm acting here! I'm acting here!" (punches hose)" He doesn't confirm that hunch by playing dead afterwards that we see. But still it's my hunch that's what he was doing to start with. He's well-clothed, seems to be wearing 2 shirts and a jacket. It was a chilly morning, so cold you can see peoples' breath, so maybe that's all it is. But he gets to keep his clothes on as far as we see, aside from footwear. The other possible faker gets to keep his clothe on as well, and stays comfy - possible perks for the volunteers on the set. Such people couldn't know the kind of torment of the naked, paralyzed, gasping children sprayed over and over in that chill, but genuinely unable to move. They aren't part of that group, and in fact - if they're deliberately acting (lying) - they would be endeavoring to cover-up the truth about the suffering and death of those others. Is That Our Star Witness? The possibility of deception here is interesting because this recovering guy is likely star witness and "proof man" Abdelhamid Al-Yousef, the famous bereaved father of dead twins who lost some 23 or more extended family members in the attack. He's also a secret militant and apparently a propagandist, whose whole family story and narrative of events is fraught with inconsistencies and question marks. Some of these we'll re-consider here. 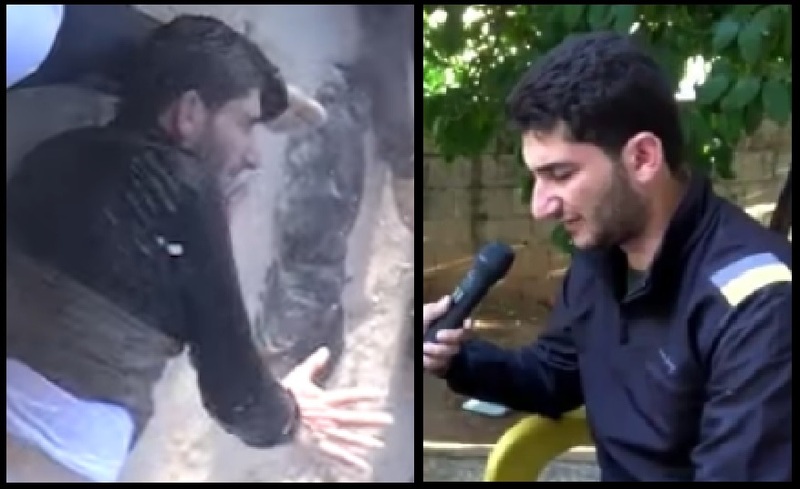 Here's the sprayed man vs. Abdelhamid Al-Yousef telling his story on April 6. This alone can't be a certain call, but this could well be him, and I suspect it is. He has the same shape of nose, same lean build, hairline, facial hair pattern, consistent fashion sense from what we see. Qoppa 999 on Twitter adds possible matches via ears, fingers (lacking a wedding ring I can see). But some of these features will be shared with his similar-looking brothers (notably Abdulkareem), besides others who could look this similar (unlikely). Qoppa999 has made some convincing matches with other members of the Al-Yousef family in this immediate area (overview, as shown). Imadeeddin is a good match, especially with his son Mohamed being nearby (a pretty sure match, as explored here - age 12, apparently considered a man). "Molham?" here is someone else - revised on a tip from Andrew via me to a better match (tweets 1, 2, 3). This better match, with closer hair color and matching scratch on the nose, isn't in this frame, but nearby. Not-Molham in the black shirt has Abdelhamid's head resting on his legs. As noted, he may be a faker, scooting away from Mohamed's blood (a point Qoppa999 disagrees with me on, FWIW). I doubt this warm-dressed and responsive guy died. The guy with supposed foam out his nose in the background I'm not sure about. But those two others and Molham at least apparently died as seen later, and here they appear possibly dead already. 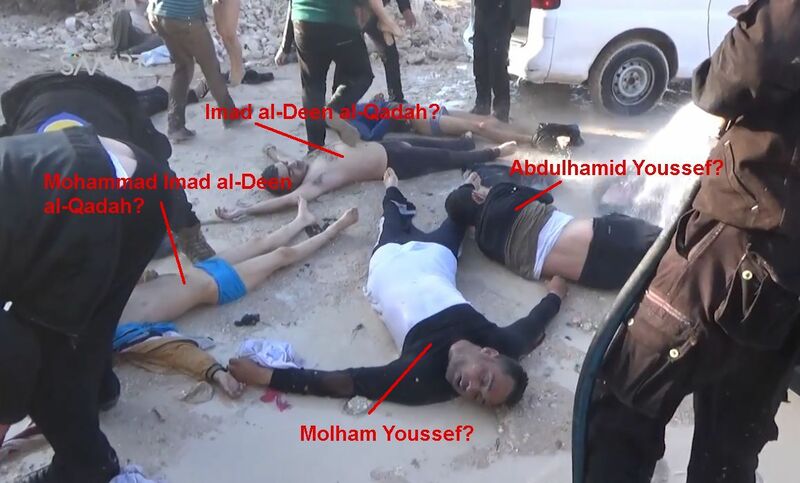 So if this were Abdulkarim who died, he would likely do as the others did and lay immobile. This victim's display of starting to recover - after possibly screwing up the act anyway - sets him apart, and suggests this is our star witness who famously lived. How Does This Fit With His Story? It's generally accepted that the first impact in the air attack was silent, releasing the sarin vapor near the central bakery at 6:37 am, with 3 loud bombs all at once following in a second pass 9 minutes later at 6:46. But Abdelhamid's initial times are screwy and backwards from this. He says the first hit was near his house (specified: 20m) at "exactly" 6:40, and woke them up with its loud explosion. It would take a couple minutes to get dressed and out the door, maybe around 6:43. Abdelhamid seems to have layered up nicely. They went outside by around 6:45 when ("five minutes later") a second strike happened near his parents' house (specified: ~100m), and at 6:50 (another 5 minutes later), another strike near his uncle's home (specified: "nearby"). He says these follow-on blasts were quiet and not explosive, and apparently caused the bad smell and ill effects. This complex clash frustrates the task of comparing. (We could adjust it so he means 6:46 for both second attacks and he didn't notice the explosive blasts and huge smoke plumes, so he means 6:46 when he says 6:40 and there were no later attacks, just the gas starting to get to them.) But either way, it should probably be around 6:50-7:00 that all this was done or realized in his story, and he would spring into action. He explains how he started by leaving his wife and kids, and some neighbor kids, in a basement shelter, or on their way to one, or with paramedics, realizing something had made them ill but thinking they were "okay." ""They were conscious at first, but 10 minutes later we could smell the odour." The twins and his wife, Dalal Ahmed, fell sick. He brought them to paramedics and, thinking they would be OK, went to look for the rest of his family." (Deeb, AP). Otherwise, he left them looking for a basement, thinking theu=y were okay, despite maybe falling ill suddenly in what he soon learned was a sarin attack. It makes little sense, but his #1 most consistent set of points is: he was certain they were okay, but they all died. Abdelhamid says he then implausibly ran to both his uncle's house and his parents' house (apparently in that order, with the first stop not mentioned in some versions), where at each spot he says he handled exposed people who all died, aside from a cousin's wife. He also "tried to help the neighbors" at one site, "but found them all dead." So his visits were almost totally fruitless except to help verify as many deaths as possible. But there was a downside; all the secondary exposure to deadly sarin nerve agent. Abdelhamid claims he finally "fainted" while carrying his dying niece at the second site. The full story is impossible to time in detail. Total time including running and helping could be 15-20 minutes up to an hour or more, depending. If it was all close and quick, and he did it all in 15 minutes, that could be at earliest 7:05-7:10 before the rescue adventure ended. More likely we're looking at 30 minutes or maybe 45, so he'd faint between 7:20 and 7:45, broadly. But to Hadi Abdullah (Facebook video) he said he collapsed but remained conscious and called for help. "they took me to the hospital," where he says "all I saw was people falling to the ground." If he blacked out at all, it's not mentioned here. He's "not sure how long" he was there, but he says he asked after his family, and "they told me they were okay." That was just his hunch, and here someone else confirms it, falsely. Strange. But "When I went back," of course they were dead. He doesn't explain why that was four hours later, or how much of that time he spent blacked out, paralyzed, or otherwise stuck at the hospital. Or was it just because he was so sure they must be "okay," like people even told him? So, back to the timeline... he's down somewhere between 7:05 and 7:45. Someone would then drive him to the hospital, perhaps the Flintstones-looking one we're looking at they call al-Rahma, where the White Helmets have their base, and all these people in the mud. It should be a short to moderate drive from wherever he allegedly fainted. Loading, driving, and unloading would probably add at least 4-5 more minutes, but probably no more than ten, before he could be seen laid in the mud there, for example. Hypothetically, 7:10-7:15 could fit. More realistically and broadly: 7:25 to 7:55, depending on complications. Next we assess the imagery to set the time he's likely seen there, and see how it fits. I can gauge solar elevation using an almost complete, very long shadow that runs nicely left-to-right with almost no depth foreshortening. But the upper half of the man's body off-frame, so estimated. His hand shadow is marked in orange, and his body stretched along the bottom so its hand roughly lines up. The dark blue line I drew is about 12.5 degrees. 12-13 deg = 7:19-7:24 am. That's sound but inexact; it should probably stretch a bit further for the orange areas to line up, but the man's full height isn't seen at this slightly down angle, so the line should start higher. Those somewhat cancel each other out, but shift my estimate a bit steeper, closer to the light blue line. It could be as early as 7:15-7:20, or maybe as late as 7:30-7:35. In the photos where he's rising, which seem to be a minute to a few minutes later, the metadata says 7:31:32 and 7:31:41 (under EXIF). 7:31 am is a good match with the visual reading. So he's at the "hospital" by about 7:25-7:30. That's within the hypothetical range, and at the low end of the realistic range. His pants are on and he's new to the fire hose, so he would seem a recent arrival at this time. And it's early; the earliest timed scene here with victims is about 7:10 am, 33 minutes after the alleged sarin drop (at 6:37). He's new here by about 10 minutes later. So the video appearance could fit with his story as far as time goes, but it's a stretch. That doesn't change that it's a stupid story to fit with, nor does it prove he isn't just pretending when he acts like a sarin victim. We can see that if he ever lost consciousness, it wasn't for very long - about 15 minutes at the very most. I started wanting to say he was seen acting and too early for his story, but in the end neither of those is certain. There are, however, a few more points I'll make about the implications of this early sighting. I or others may think of more in time. Considering his story, Abdelhamid should be seriously contaminated here; his wife and kids next to him were exposed within minutes, so he would be too, if lightly. 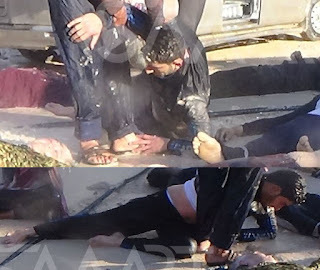 He says he ran to two effected sites and touched and carried numerous sarin victims with no protection, their skin and clothes allegedly rubbing right against his, just minutes after they were exposed to fatal levels, all with little or no protection or decontamination. This would be consistent with him passing out, but also probably with him dying, and at the beginning, after he touched the first or maybe second victim. If his exposure was serious enough to cause loss of consciousness, it would almost surely show its other signs, including uncontrolled diarrhea and vomiting, and the rest of the SLUDGE syndrome, paralysis, pinpoint pupils, labored or non-functional breathing, and likely a blue color (cyanosis). But these things are not evident with him at all. The lack of these signs of primary exposure suggest he was not exposed to sarin, at least to any serious degree. That would also mean there's little or no danger of secondary exposure for anyone touching him. But supposedly, there should have been a great danger. It should be expected that whoever picked him up from the sarin site, likely with no protection or decontamination, would fall seriously ill, and whoever loaded him off the truck as well. But somehow I doubt this happened (besides doubting the whole story up to and past this point). Now he's been hosed off a bit, which helps the problem some. But he retains all his clothes with their particle-entrapping folds. 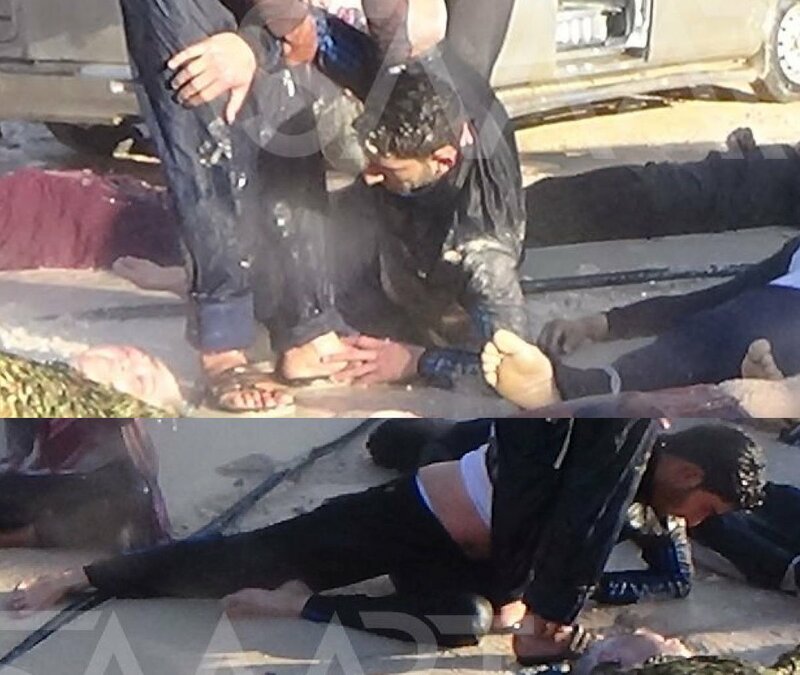 Then we see this Islamist guy just grabbing his sleeve with both hands, wearing no gloves or any protective gear, in fact wearing sandals as he wades in the rinse that should be deadly. Again, this is at 7:25-7:30, at most 35 minutes after Abdelhamid's last alleged exposure and blackout, maybe less than 10 minutes after. I'm no expert, and I know sarin persistence is overplayed by many, as Higgins at Bellingcat noted. That article cites some research giving sarin evaporation times ranging from 2.5 to 24 hours, depending, and others saying it will evaporate from the air and from solid surfaces faster: in winter (-10 degrees Celsius) it's pretty safe after 8 hours, and in the summer (15 Celsius) in just 30 minutes. A cold morning in early spring like this will be between the two but closer to summer: maybe an hour, probably more like 2-3 hours or even longer, by the quicker estimates. So this 10-35 minutes will not be safe by any measure, when it comes to more absorbents surfaces like skin and clothes or soil. Little children (who also tend to lack signs of sarin exposure, though many seem poisoned with something) are stripped naked or to their underwear or diapers, and hosed over and over. They should have each been at one attack site only, and still they never seem clean enough. 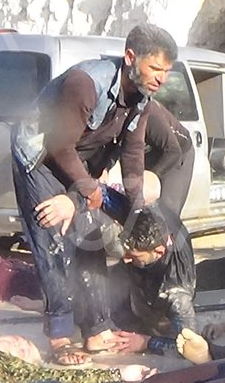 But this alleged walking mop for sarin who says he ran through three different plumes of the stuff and embraced contact with victims in each is fine to touch almost just how he came in. Not to the Rescue: Why? If that's star witness Abdelhamid Al-Yousef seen recovering, he must be freshly brought in after fainting just minutes earlier, at almost the earliest plausible time. By the vague details, he could be unconscious, or perhaps recovering; maybe mobile but tired, or maybe paralyzed, depending. But we see he's rising around 7:30. And yet Abdelhamid claims he didn't go to check on his family at this time, or for over three hours afterward. Why? You would think it's because he was blacked out, but he's inconsistent on that point, and we can see its duration is irrelevant. * He says he asks after his family first thing after he "comes to." * He's likely seen recovering and trying to stand (or acting like has to try) between 7:25 and 7:30. * Did he black out again? Because he then spends at least 3 and maybe 4 hours failing to save his closest family, aside from being told they were dead or okay. Is that adequate reason to just stay lounging around? Why is he so vague about this time frame? * He claims to finally return after 4 hours, rounded off, from either ~6:50 (parting), or from his arrival at the hospital, so his first rescue attempt for his most beloved would be around 10:50-11:20 am. By then, of course, it was far too late. He seems to blame that loss of faculties, and/or a prolonged paralysis, for his fatal delay. But we can see how unlikely that is. Did he remain just a bit too weak for that long? Was he not allowed to go? (in the lower right frames shown at top, is his left wrist handcuff red?) Or did he really have nowhere to go and no one to save? Was he just appearing there in the first place to help explain why he couldn't save his alleged family with the carefully staged photo record? "I left them ok," he says, and some 4 hours later, for no evident reason, "I found them all dead." Indeed, infant Mohamed has a splotchy red face of someone left face-down for a few hours after death (livor mortis), besides an unexplained irritated facial scrape - something many victims have, and it's an open question. In one version (ABC), Abdelhamid was passively told that his wife (Dalal, but given differently here) was alive when rescuers found her in the shelter, but unable to walk and fading. She was supposedly still holding the twins, who were dead. But would she hold Ahmed face-down? She and the rest should have been rescued from the shelter at this time, whenever it was. But to Hadi Abdullah, Abdelhamid says "when I came back I was told they were at the shelter," as in still sitting there around 11 am. He adds "We went to bring them out but found that they were all dead." So was she not found alive? Could he have saved her himself if he'd left the hospital? It's unclear, and it's all still just part of a story that's probably fictitious from top to bottom. As usual, all he has to remain consistent about is he thought it was "okay" to leave them, he couldn't come back for unexplained reasons, and in the end they all died. To ABC he said, "between tears," how he greeted his stiffening twins around 11 am: "I told them, 'Hello darlings. I took too long. I rescued everyone else but I couldn't rescue you ... I was expecting them to hug me back." He still seems shocked that his special people could die in a basement, after being left alone for four hours after falling ill at the outset of a sarin attack. But that was probably him seen recovering, or acting like it, some 3-4 hours before before he finally learned they were dead. He should know by then it was pretty deadly, and had reason to suspect maybe they weren't okay. Why didn't the urgency to find out, or to see if he could save them, spur him to action? This is a puzzling question for those who buy his story. He has no good explanation for wasting this time. 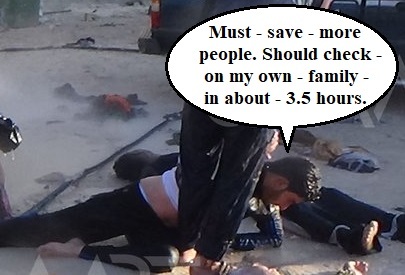 He and his rescuers show no sign of exposure to sarin. He may have been acting. His story is stupid and full of inconsistencies, clashing even with the accepted rebel version that itself clashes with the best evidence and with common sense on every front. The attack he has so much detail about appears to be a much different event - an Islamist massacre he's helping to cover up. He's an undeclared militant in an area run by genocidal Islamists who had just, by reports, kidnapped some 200 civilians whom they dragged to Khan Sheikhoun, just five days before they showed us truckloads of people there, poisoned under still-unexplained circumstances. Abdelhamid is one of the big reasons we still don't know the truth. But one way or another, he's just a cog in a larger machine that requires this sustained high level of deception. Reading it, some of the things in the new UN report are simply not true. Looking forward to reading your take on it. 4 hours is just before the bombing: good call, crossed my mind too. But as far as I see, videos continue somewhat, and he seems to not be in them (that anyone's noticed) after he starts standing up. Maybe he was back in the hospital, or the employee lounge? Dynamic persistence: I'm sure that's true, up to a point, unsure what point. At least it's something to start a comparison with. I think even they'd admit the time in untenable, and would emphasize the hosing. KS locals who support the government and could be called on to volunteer to collect samples (not through rebel volunteer networks)... these should exist. I was a bit surprised to hear from the SOHR how a school principal there had managed to remain in her job while espousing pro-government opinions, or criticizing the Islamists. Only just the other day was she knifed to death along with her brother, and locals are reportedly pissed off about it. I suppose it just might be that dynamic or more. UN report - thanks for the tip. I'll look at it soon. Last post, see my latest on your video questions: I think I can narrow down 2 of your 3 'hospital' scenes.